Happy Memorial Day! 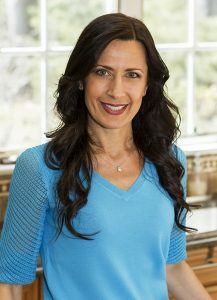 I thought I would slip in a quick recipe in case you were looking for something simple and healthy to make. Truth is, I am feeling a bit guilty because we actually left our 4 boys for one night this weekend, which is a rare occurrence. 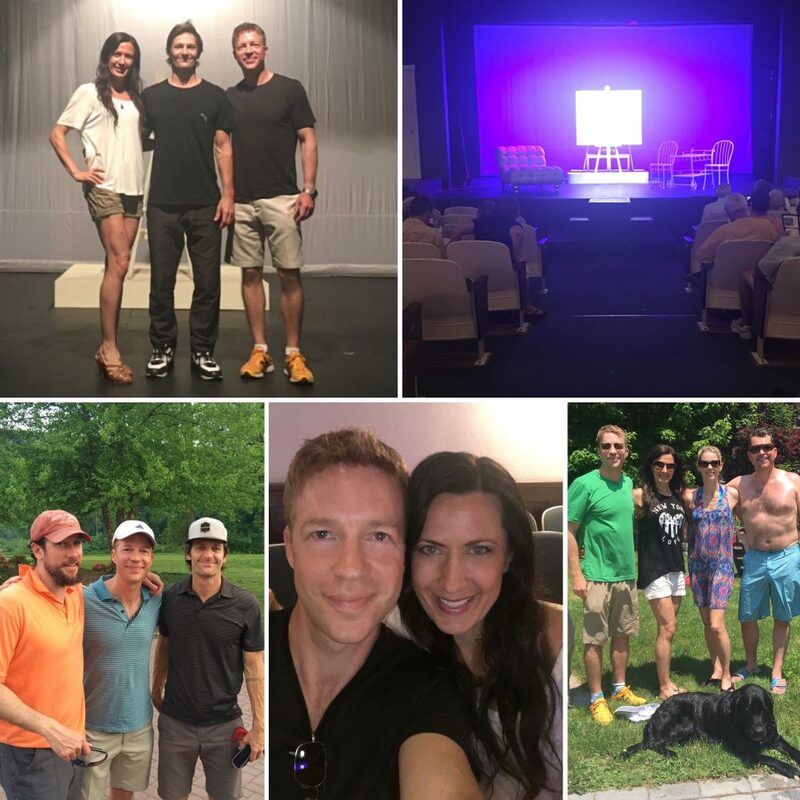 A long overdue, much needed escape to see some friends act in a play called “ART”. The performance, I may add, was fantastic. 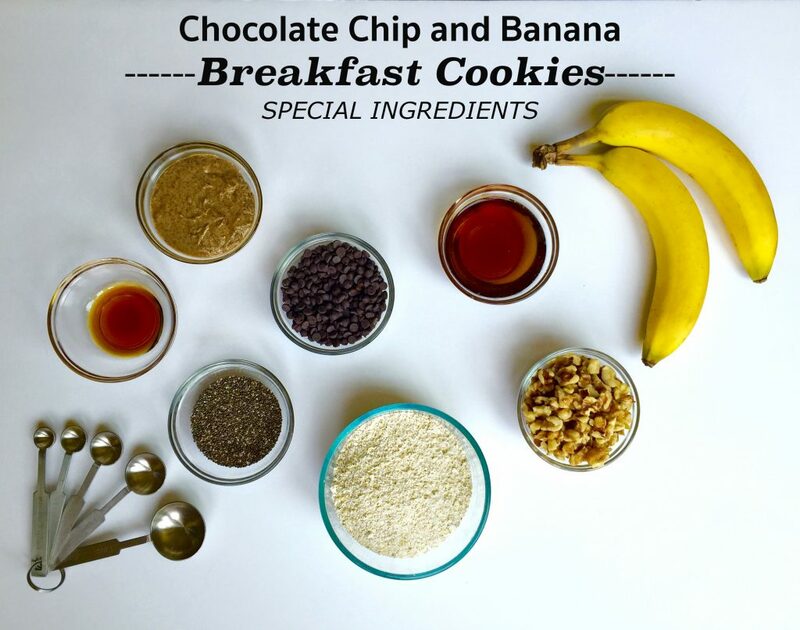 So here I am making my boys one of their favorite “healthy” treats just so I can see the big smiles on their faces. 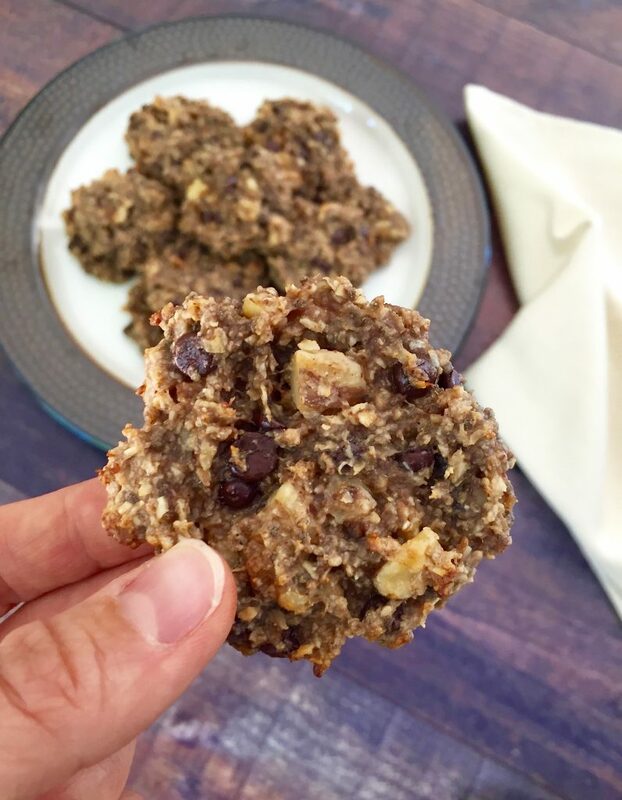 I not only used gluten-free, vegan substitutions for these cookies, I also added a few power packed ingredients to give it an extra nutritional bonus. There is plenty of protein from the almond butter and walnuts which are beneficial in building muscle. Bananas are a great source of potassium and combined with sodium work to balance the fluids and electrolyte levels in your body especially after a long run. Oatmeal contains a type of soluble fiber called beta glucan which aids in lowering LDL cholesterol levels. High in fiber, oatmeal will help you feel full longer, eases constipation and also controls blood sugar. This leads me to my final healthy ingredient… Chia Seeds! Native to Mexico and Guatemala, chia seeds are a great source of fiber and omega-3 fatty acids. Other benefits include calcium, iron, magnesium, manganese, phosphorus and zinc. 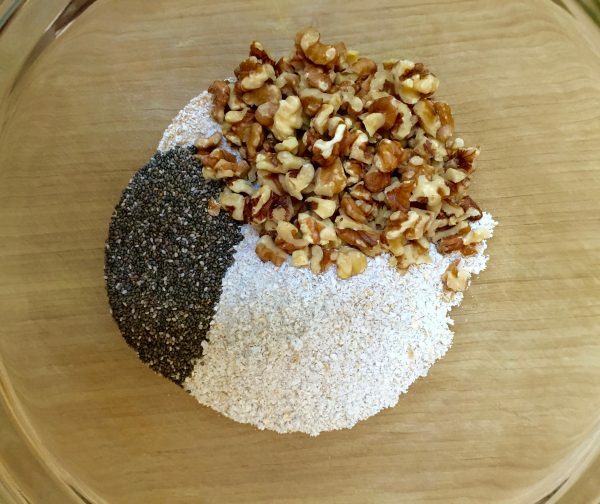 Not only an excellent added nutritional bonus, chia seeds can also be used as an egg replacer. When combined with water they form a gel-like consistency (mucilage) which helps bind the recipe. 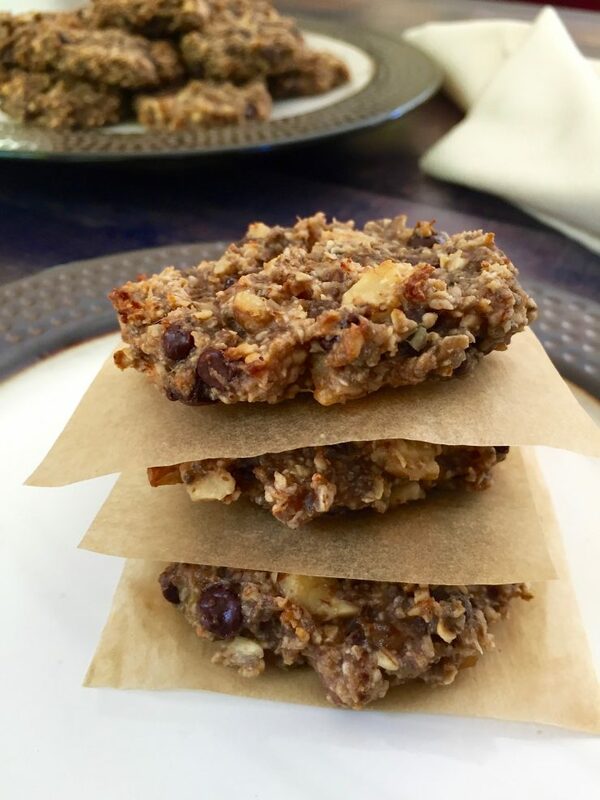 Most importantly, I love to see the look on my boys’ faces when they take a bite of this flavorful, gooey and delectable treat! 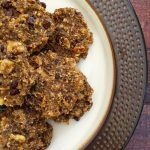 This delicious, healthy treat makes a great post-run snack and could even be a wonderful option for breakfast. 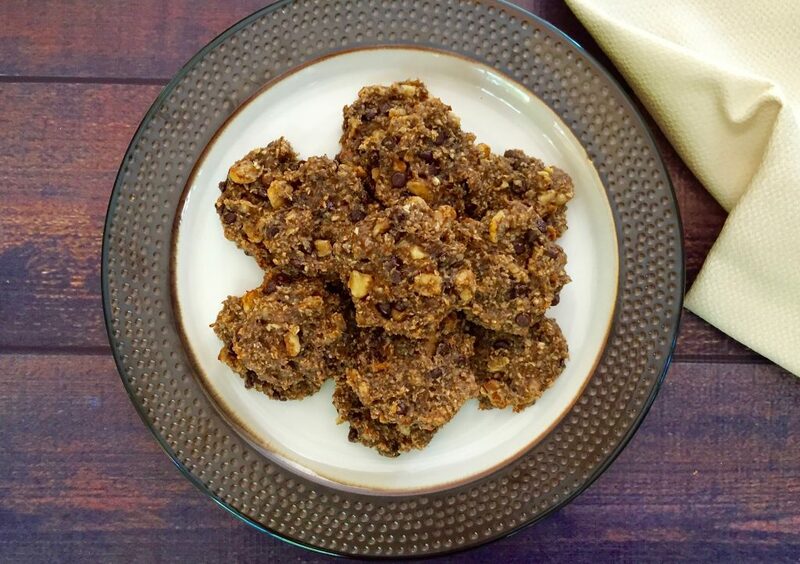 Along with its divine taste, gooey consistency and scrumptious combination of flavor, eating a few cookies will help you achieve your daily dose of fiber, protein and omega-3 fatty acid. 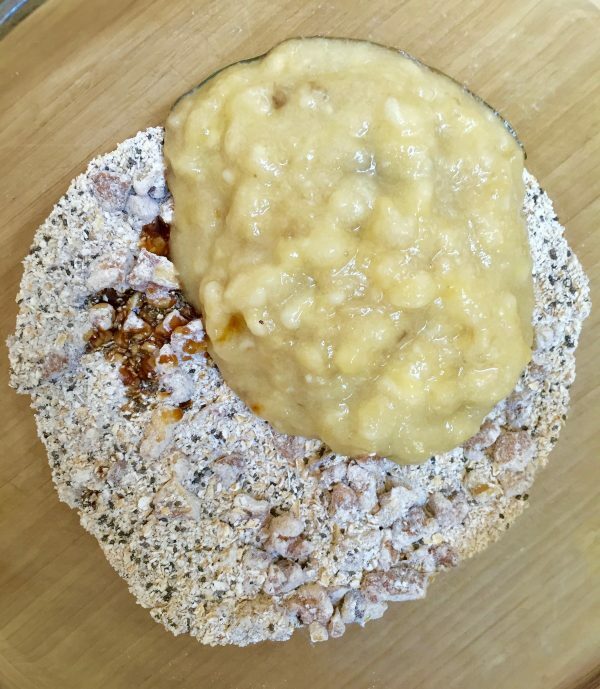 Combine oatmeal flour, walnuts, chia seeds and sea salt in a bowl. Then add banana, vanilla extract and mix well. 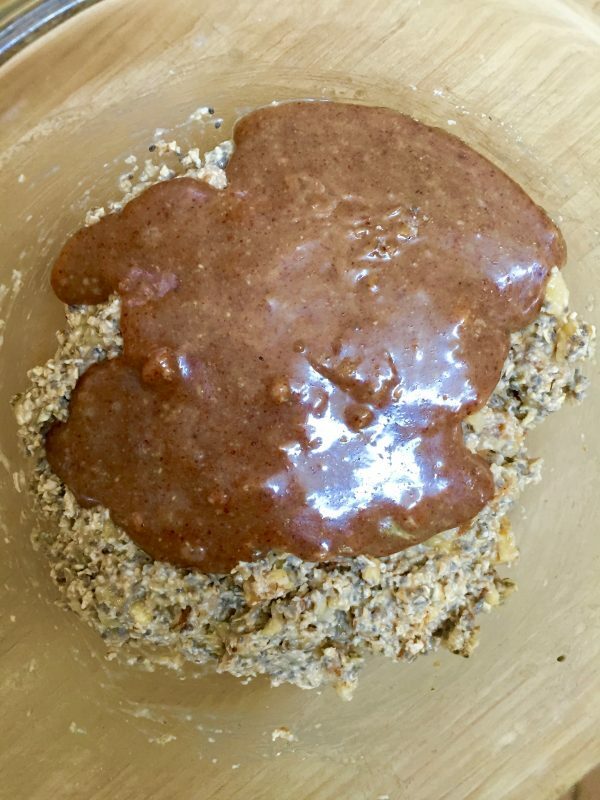 Melt almond butter and maple syrup in a pan on the stove and then combine it to the mixture. Let it cool a little before adding the chocolate chips so they don't melt. Form balls and firmly flatten them into a cookie shape onto the pan. It will be a bit sticky. Bake for 12 minutes and allow them to cool for about 10 minutes. Makes about 22 cookies. 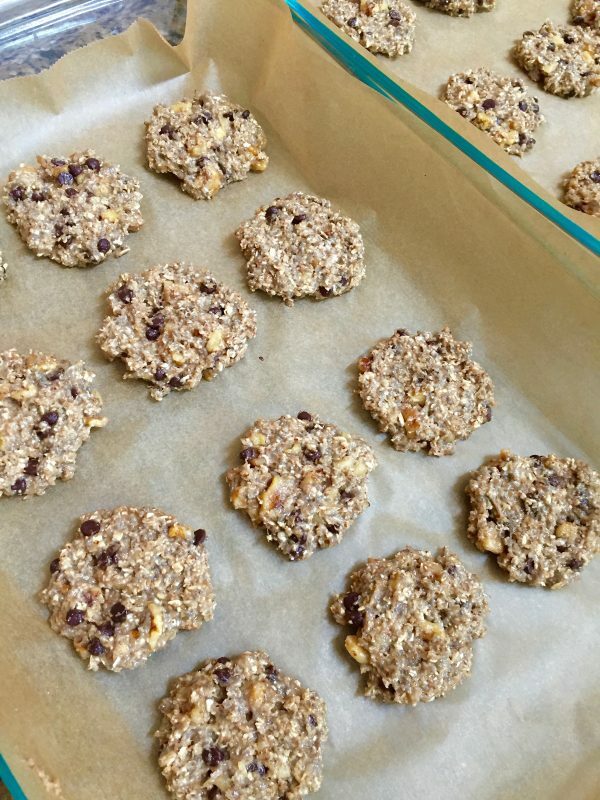 Love this healthy alternative recipe for chocolate chip cookies! Definitely going to try this one! Sounds and looks absolutely yummy… Thanks for sharing! Thank you so much! So happy to hear that . I would never think to mix those ingredients together. Great idea! Thanks for sharing this wonderful recipe! This is right up my alley! Your boys must’ve really loved these. They look delicious! I will definitely try this recipe! My kids really do love them and they are healthy so I feel even better by giving them seconds! So happy you are going to try the recipe. I was looking for something healthy sweet and quick for morning rushes. Sounds great. Will try! I’m so glad I can help!! Thank you! It is a great combination and so healthy:) Let me know how it goes when you try it.